The two candidate responses follow below in alphabetical order according to last name. If your question and/or comment is for a specific candidate, please refer to that individual by name so as not to confuse. Voters will select one of these candidates in November for the school board. The School Board’s central challenge is sustainably delivering a high quality product at a reasonable cost. In addition to benefiting our children, excellent schools keep our community healthy by attracting and keeping families, companies seeking the best employees, and businesses to serve this robust community. Part of what makes our schools effective in their educational mission as well as being a productive part of our community is their efficiency. Productive schools, like productive homes or businesses, do not run themselves. Our school board has a long tradition of affordably providing excellent results, and there is no more important work I could hope to do than to help continue that tradition. An effective school board brings together a variety of perspectives from the community, with the hope that the consensus the board reaches advances the common good. My perspective is primarily a mother of three young children who are (or will soon be) in the district’s schools. My husband and I are both Conestoga graduates; between us, we are alumni of Valley Forge Elementary, Devon Elementary, Valley Forge Middle School, T/E Middle School, and Conestoga. After living in all different parts of the country for twelve years after graduating from Conestoga, we returned to T/E (first daughter in tow) eight years ago to raise our children here, in large part because of the schools. Because the schools here mean so much to my family, we want to give back. Growing up, my parents were constantly active in public service in this community, and they instilled in me a passion for service as well. There is a strong core of leadership and teachers in the district. I plan to put my full energy and enthusiasm into the job of helping them excel and providing them with guidance from the community. I am committed to learning about the challenges facing the district, and believe it is important not to rush to judgement. There is usually more than meets the eye to any difficult problem. One “issue” in particular that concerns me is sustainability. Every day, the district leadership is bombarded with new and important demands. Because of my perspective as a parent of young children and a lifelong resident, I would hope to keep an eye on where we will be in five, ten, or twenty years. By planning not only for tomorrow, but also for the long term, we can responsibly provide the next generation with at least as many opportunities as we had. My professional background – a degree from Cornell University in communications and experience in marketing and public relations for some of the world’s largest law firms – colors my perspective as well. A thorough yet organized flow of information among all the relevant stakeholders – students, parents, residents, administrators, teachers, businesses, and so on – is certainly vital for an effective board. Thank you for the opportunity to comment, Pattye, and thank you and everyone else who gets involved in our collective mission to keep T/E a wonderful place to live. My name is Francis Reardon, and I live in Easttown Township. As a candidate for School Board Director the one issue that caught my attention was the plan to privatize and subcontract out the employment of our current teacher aides, substitute teachers, and para-educators. The stated reason given by the School Board was that the school district could not afford to provide this group of employees, who average about $20,000.00 per year in pay, with health insurance. We were presented with cost numbers picked from close to the top end of the insurance cost scale which seemed to have no relation to the employees in this group. This process played out over a two year period and the final decisions were worked out in private sessions without knowledge of or input from the taxpaying public of TESD. During this process it was astounding to see how money is spent and justified by the school board. They seemed to have forgotten the value of the dollar. In my personal life, after high school I spent two years in the United States Army Infantry. Soon after the Service I attended Temple University, receiving a Bachelors of Science Degree in Education. I was a substitute teacher in the Philadelphia School system and then taught at a high school in Chester County. I soon discovered that I was better suited for a different career. I started working in construction in 1973 and retired in 2006. For thirty of those years I had my own construction business and was very fortunate to be doing business in Chester County during that whole time period. In 1980 my wife and I moved to our present home and raised our six children here where they attended St Norbert School, Archbishop Carroll High School and Conestoga High School. My family has been blessed with the opportunities provided both by our community and Conestoga High School. Our school employees should have the same opportunities. Together with common sense decisions we need to show common decency in how we treat our school district employees. I think we have failed our teacher aides, substitute teachers and para-educators. All groups of school district employees should be treated the same and the school board can correct this situation. In the future the school district will have to continue to make many important decisions in the area of personnel. Beside salaries, the pension and benefits have to be structured to work long term. We cannot promise everyone long term benefits and fail to fund it short term. We have created a situation where one group of employees works to protect their interests to the detriment of other groups of employees in the school district. I believe my past experiences have given me the background and common sense decision making skills to continue the excellence of the TE school district. If given the opportunity I hope to serve the community and everyone involved with the school district as a director of the Tredyffrin Easttown School Board. In Pennsylvania, the State is mandated to provide education to our children. Local municipalities are permitted some autonomy in operating educational franchises. This autonomy is centered on fiscal management and meeting established minimum standards…districts that fail come under State control. We achieve educational excellence in T/E for reasons schools succeed anywhere…engaged parents who value education, experienced professionals in the education function and a socio-economic demographic that promotes physical and mental health. T/E will continue to excel educationally because you (and I) will accept nothing less. In selecting SB members, we should understand the power we give them. The Position we’re discussing regards the management of the local educational operation; largely relegated to business/organizational decisions and setting a local tax rate. Educational excellence is the over-riding mission but THIS JOB is very specific. The inalienable right of the SB Member is to levy taxes…that affects every household and business in our community…THIS JOB is to assure the money is spent wisely. To “keep our schools great” or “make education better”, one should seek a position in the Education Department…curriculum is State mandated. To change the State’s funding of PSERs, the election venue would be State Representative. No person in this race is running for teacher, coach, administrator or good parent…those jobs feature direct contact with students. I’ve been a Tredyffrin citizen for 20 years, attending School Board meetings for 5 years. From the “EIT Study” until today, I continue to educate myself on the operation of our District. I became an activist, speaking out was necessary. I’ve written in The Suburban many times regarding T/ESD finances, worked with a group of para’s/aides (at their request) to prevent their outsourcing, compelled the Board to release documents in the PA Open Records Office case Colligan vs T/E School District and continue to speak out on District issues that impact the community. I’ve worked with some great people…R’s and D’s and I’s. You can read about the positions I’ve advocated by searching this site. I am who I am and will continue to be…that’s my BIG promise. The job is straight-forward. Deliver excellent education while operating efficiently….that’s what you deserve. Basics: be honest with the community in financial matters, welcome community input, adhere to established rules regarding transparency, focus on long-term viability of the system and be a good community citizen. Follow that path and the T/ESB won’t be constantly locking-horns with the public….TEMS fence…$5 MM garage…deficit budget/maximum tax increase/annual surplus cycle…outsourcing paras/aides…secret meetings that s/b public…shouting down community members…ALL can be in the past. The attitude of “we know better”…”the community doesn’t need to know”…”they’re OUR schools” needs to change…THAT’s the #1 issue. I’m (uniquely???) qualified for THIS position…my accounting degree and MBA provide the education necessary for the task, years of educating myself prepare me for the position and I’m not too full-of-myself. My record is easy to access…watch the last/any video of a SB meeting, search here if inclined. Know the candidates: prepared?…share your values?…have leadership qualities? Change is coming… Thanks for listening. As a geoscientist with a Ph.D. from Penn State who has spent the last 12 years working at Princeton University, I have spent most of my career in environments of educational excellence. After working in research, I moved into science management and communication, gaining extensive experience in project coordination and outreach to the public, including teacher professional development. I am currently the project manager for a $3.5 million/year ocean research initiative at Princeton (http://soccom.princeton.edu), which has given me additional experience in budgeting and consensus building among stakeholders. 1. Spending is focused on students. Recently the Board has committed to significant expenditures for capital projects that were not adequately justified to the community, including issuing $24 million in bonds for future projects and approving a $4.5 million facilities building. Funding decent and safe school buildings is important to the education program, but I would push to provide details on design and costs long before the meeting where a final vote is held. In addition, with over $30 million in our reserve fund I believe the Board should set a formal target for an adequate fund balance and develop strategies to limit the fund’s growth, such as committing surpluses to the following year’s operating expenses or increasing contributions to capital projects. 2. Our district is providing a competitive 21st century education. I am concerned about the impacts of high stakes testing and would propose an internal review of how much time (and thus money) is being devoted to preparing for PSSA’s and Keystone Exams, plus the costs of remediation. I would also propose actively soliciting input from parents, teachers, and administrators on how current curricula and services are working for our students. As a particular area of interest, I would advocate strengthening partnerships with local universities and businesses to enhance STEM initiatives, including internships and after-school or summer programs. 3) Community members are active partners in improving our district. Residents of T/E deserve to feel confident that their tax dollars are being used wisely to provide a first-class education for every child in T/E. I believe my background and professional experience have prepared me well to safeguard the interests of both students and taxpayers, and I hope voters will agree. I am happy to answer questions and can be reached at hotinski@hotmail.com or (484) 320-7470. My name is Todd Kantorczyk, and I’m a candidate for Region 1 T/E School Board Director. Serving on the board of a successful public school district like T/E requires directors to devote attention to a wide array of issues, many of which arise or shift significantly over the course of a school year. Accordingly, choosing a single issue above all others would not be an accurate reflection of how I intend to approach my responsibilities as a school board director if elected. With that said, I do believe a critical issue that will require much of my focus is ensuring that our district continues to provide a high quality education in an environment that demands consistent and transparent application of sound fiscal principles. By all objective measures, we have excellent public schools. Our schools provide a wide array of benefits, all of which maintain our home values and help define us as an outstanding community where people want to move and live. But it will be a challenge to maintain this excellence looking at the financial pressures facing the district. For example, the district will face almost $44 million in pension obligations over the next five years plus increases in unfunded mandates such as high stakes testing. At the same time, the primary sources of revenue for the district are taxes from residents and businesses, and recently the current board has asked the community to shoulder additional tax burdens. Accordingly, it is critical to ensure that: (1) funds are being managed in a fiscally responsible manner that adequately supports our excellent educational programs; and (2) requests for additional tax revenues are scrutinized and minimized. As the child of a former school board president, I appreciate the important role that committed local leaders can play in making sure that public schools deliver for our children and the entire community. Finally, I feel strongly that our neighbors can provide valuable input on this and many other issues. To that end, I would like to explore ways to increase public engagement and board transparency, including revising the procedure for interaction at monthly board and committee meetings. Moreover, I hope to advocate for more local control of our schools so that our community, rather than Harrisburg or Washington, can decide how to focus our educational resources. For additional questions, please contact me at toddfortesd@gmail.com or 484.832.8888. Thank you. I welcome the opportunity to speak to what I believe is the most pressing issue facing the T/E School Board: how to transition from the strong leadership of Dr. Waters and work with incoming Superintendent Gusick to keep our school district the best that it can be without overspending taxpayer money. This will require cooperation and foresight, and it should be undertaken by those with the humility to listen, the energy to think about where the district needs to be several years from now, and the courage to take steps now to make that possible future a reality. The question is, will the Board sit back and let administrators decide most everything, merely providing a rubber stamp for their plans on the theory that educators know best what they need? Or will the board members be proactive, strategic and constructively critical partners, offering their own unique insights and always listening keenly to the parents and the taxpayers with the understanding that we all have to live with the consequences whether we use the schools or not? To my mind, the answer must be “no” to the former and “yes” to the latter. There are a great many things that educators are uniquely equipped to handle – e.g. the curriculum and the quality of the hired teachers – but there are many other areas in which the citizens and their representatives must have significant input – e.g. salaries and benefits, administrator to teacher ratio, how much we should provide for facilities and safety, and how all of that that impacts the taxpayers and the quality of life in the surrounding community. It appears that the District has managed the education side quite well, but there is always room for improvement on the other issues, along with earning the confidence of the citizens that their voices are being heard throughout. What qualifies me to join the team of school directors in what promises to be a new era is the insight that comes from working cooperatively to manage a business enterprise. I am a graduate of Lafayette College and the Law School of the University of Pennsylvania. My day job is as a commercial litigator in Philadelphia with the law firm Harkins Cunningham LLP where I have spent 23 years representing companies large and small in lawsuits involving state and federal law. But I don’t just practice law, I also help manage my firm. I know what it means to meet a payroll, to lease real estate, to manage mostly wonderful and occasionally not-so-wonderful employees, and to do so in an environment that requires the consensus of a small group of very dedicated, intelligent people who are not afraid to speak their minds. I also understand neighborhood concerns about the aesthetic health of our community, having served on the Tredyffrin Zoning Hearing Board since 2007. I hope to continue my service by helping to set the future course for a school district that I have called home for over twenty years and to which I have and will entrust the secondary education of two of my children. I will be honored to have your vote to enable me to do so. With Election Day 2015 still four months in the future, the Tredyffrin Township Democrats are not letting the “dog days of summer” keep them from going after one of the Republican TE School Board candidates, Dr. George Anderson. With a headline reading “Extremist Views Espoused by TE School Board Candidate”, an email blast was sent to the TTDEMS mailing list and the article posted on their website. The use of graphics and commentary from Dr. Anderson’s personal Facebook page provide the proof of the TTDEMS accusations (see below). The individual responsible for the TTDEMS email and the website entry is TE School Board candidate, Democrat Alan Yockey, but I am told that the other three Democratic school board candidates support his actions. Yockey (D) is a candidate for Tredyffrin Region 2 whereas Anderson (R) is a candidate for Tredyffrin Region 1. Although Yockey and Anderson are not seeking the same TE School Board seat, it was interesting to note that Yockey used a entry from Anderson’s Facebook page, which also included a photo of Republican Ed Sweeney. Sweeney is a school board candidate for Tredyffrin Region 2, the same seat for which Yockey seeks office. It’s unclear whether Yockey’s inclusion of Sweeney’s photo from Anderson’s Facebook page was an oversight or calculated to discredit this school board candidate by association. Politicians and political parties are in the era of Internet campaigning. Creating a social media strategy for use during political campaigns has quickly become an essential part of every candidate’s plan to get into office. Today’s example by the Tredyffrin Democrats shows that the use of social media is a two-edged sword. Facebook, Twitter, Instagram, etc. are all useful tools to help win an election but as Anderson (and possibly Ed Sweeney) learned today, can also be the secret weapon in local politics. 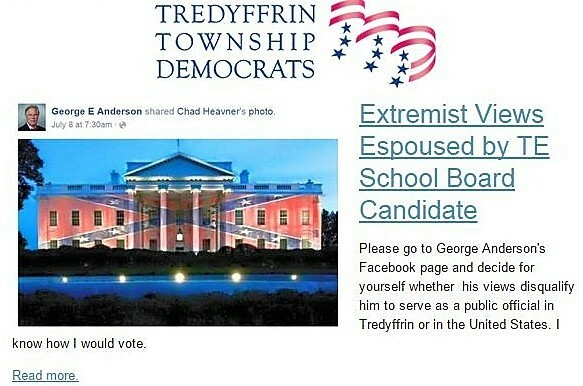 School Board candidate George Anderson and Tredyffrin Township Republican Committee Chair Neill Kling both provided responses to the posting by the Tredyffrin Democrats (see statements below). The Chair of the Tredyffrin Township Democrats, Kathleen Keohane, was contacted and should she provide a statement, it will be added to this post. The level of effort which went into this email is interesting. I do post many political items on my personal page, and they are generally opposed to the policies of this administration but it also includes photos of my new Koi pond, photos of my birds and pictures of Bulldog puppies. One is forced to ask; why has someone put in so much effort, going through thousands of posts, to slandering me? Is it because on my official Facebook page (Dr. George Anderson for TE School Board), I expressed the radical concept that “We owe our children the best education we can provide. We owe it to our citizens to achieve that goal in the most transparent and frugal way possible.” or perhaps it was the extremist concept that members of the School Board work for the citizens of the TE school district and should be available to them. 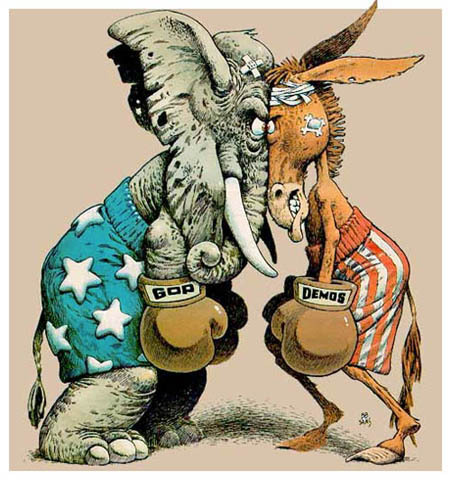 It is an old saying “If you cannot attack their ideas, attack them personally.” With, personal attacks this early in the election cycle, one is forced to ask, who or what is the Democratic machine trying to protect? 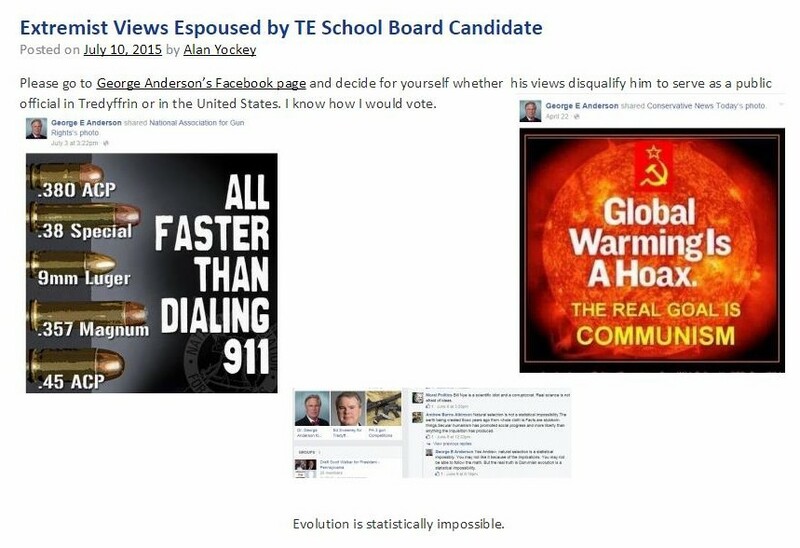 I understand that the Tredyffrin Democrats (in the person of Region 2 School Board candidate Alan Yockey) have sent out an e-mail attacking Region 1 School Board candidate George Anderson as an “extremist” based on material that he has re-posted on his personal facebook page. Thank you for giving me the opportunity to respond. This is a tactic that the TT Democrats used in the last local election to foment opposition to our Republican school board members and candidates. It seeks to demonize certain of our neighbors who put themselves up for election and divide our electorate rather than bring us together to address the challenges that our school district faces. I’m sure that we Republicans could find material against our Democratic opponents that would perhaps paint them in a way that some of our electorate would consider extreme. But these are our neighbors, this is not the campaign that we Republicans choose to run, and we will not respond in kind. Such tactics do not produce a healthy environment for school board (or any other) governance going forward. Our school board candidates, while certainly all good Republicans, are individuals with many perspectives and talents who bring their personal opinions to specific issues (issues we hope to engage fully in the Fall campaign) while focusing generally on the core principal of good stewardship — of our children’s education and safety, of our hard-earned tax dollars, of our invaluable school employees, and of our school facilities. 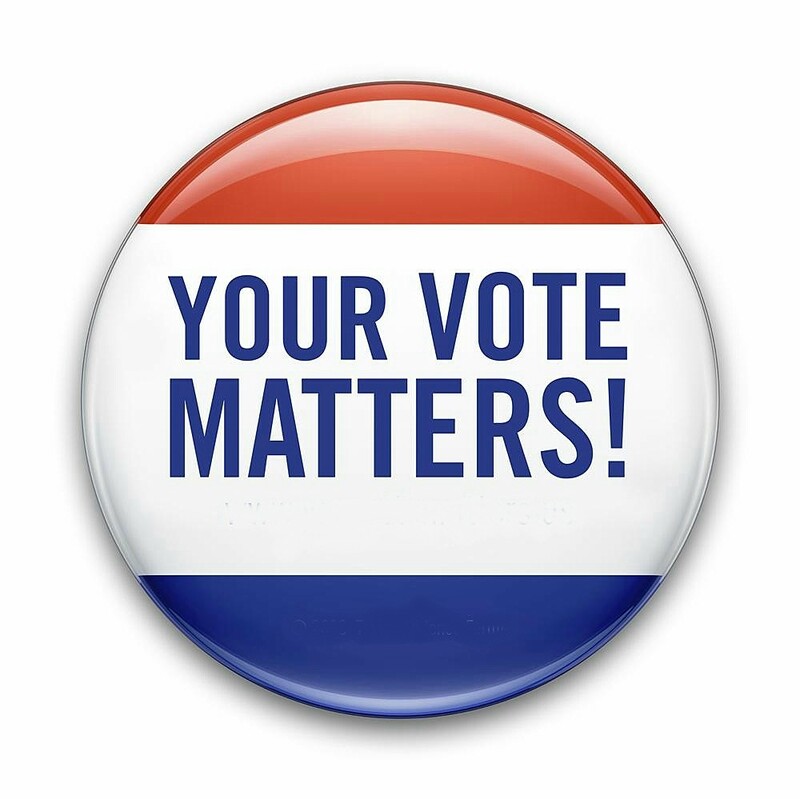 School Board is an unpaid, difficult, often thankless job and each of our neighbors who has served and has stepped forward to ask for your vote this November (Republican and Democrat) deserve our respect. I also understand that Mr. Anderson has sent you a response to Mr. Yockey’s post. For my part, I know Mr. Anderson as a devoted father and husband, as a former student of the T/E Schools, as an educator at Valley Forge Military Academy who is also tasked by that institution to bring diversity to its ranks, and as a person with a strong background in finance. Mr. Anderson has told me that he welcomes any discussion about his views and he will be walking the neighborhoods this Summer (as will all of our candidates) so that our neighbors can get to meet him and engage him in conversation. I hope that all take the opportunity to do so. Since this Community Matters post went up yesterday, the graphic from George Anderson’s Facebook page which included Ed Sweeney’s photo was removed from the TTDEMS website and replaced with a different graphic. I appreciate your bringing this troubling issue to light. I disagree strongly with Neill Kling’s characterization of the TTDEMS’ webpage post and email to our subscribers. They cannot be reduced to “a politically motivated attack” on a private person who reposts what some may find offensive material on his Facebook page. Understandably, our candidates expressed disbelief and revulsion that a person holding this view could be in the position to make decisions about the welfare of our District’s children. No one disputes George Anderson’s right to express whatever views he may hold. But there are consequences to doing so. I believe every Tredyffrin voter needs to take a careful look at each of the candidates running for local office. Yes, they are our neighbors, and we appreciate their willingness to step forward to make a difference in our community. But who are they, and what do they stand for? We are less than a month into the lazy days of summer, and I know that few people are focused on the fall election right now. From a political standpoint, our party’s decision to take a stand against George Anderson on July 11 was hardly strategic. It simply had to be taken. His heartless belief that it should be a crime to administer life-saving medicine to a dying addict, along with some of his other extreme views need to be known. I feel certain that the reasonable, caring, well-informed people who live in our community will reject them.